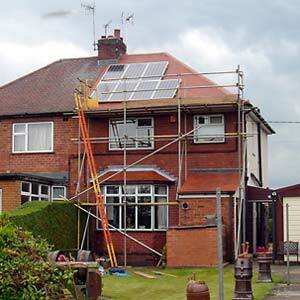 Mr M installed a PV system of 7 panels on his south facing roof in Nottingham in July 2011. He started receiving the government Feed In Tariff at a rate of 43.3p/kWh for the generation and 3p/kWh for the export tariff, deemed 50% of the amount of electricity generated. The payback calculation for this system gives an approximate generation annual income for the first year of £485.00, an export income of £16.80 and an approximate £65 savings from energy used. This gives a total income and savings for the first year of £566.80. The system took one and half days to install and was supplied with a performance warranty of 25 years and an installation warranty of 5 years. The system has been installed by a MCS registered company so therefore he will qualify for the Government FIT, which will be paid to him directly from his energy provider. Mr M will expect a 9.6% return on his investment.